Russia’s Soyuz rocket suffered a rare on-pad abort on Saturday, shutting down its engines during the ignition sequence with just seconds to spare before liftoff. The 46-meter tall Soyuz 2-1B had gone through a smooth countdown towards an 18:56 UTC liftoff with the Resurs-P No.3 Earth Observation Satellite when running into trouble around ten seconds before the scheduled launch time. 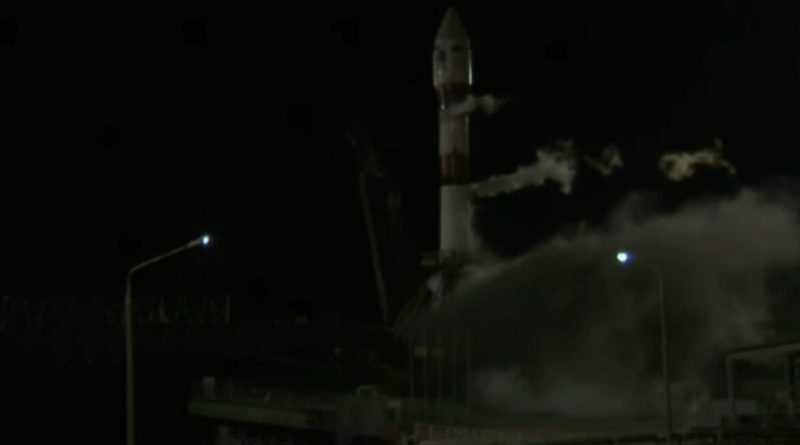 Soyuz was moved to Site 31/6 on Thursday in an eerie setting with thick fog at the Baikonur Cosmodrome, setting the stage for the rocket being placed in its vertical launch position for two days of checkouts and launch preparations. Soyuz 2-1B headed into an eight-hour long countdown on Saturday, starting with systems activation for checkouts and tanking preparation at the launch pad. The Russian State Commission completed its final pre-launch review and approved Soyuz for tanking, starting inside L-4 hours to fill the four boosters, core stage and modified Block I upper stage with around 274 metric tons of Liquid Oxygen and Kerosene. Throughout the countdown, regular status checks with all support stations were conducted and no issues were present when Soyuz headed into its Automated Countdown Sequence six minutes prior to the opening of the day’s ten-second launch window. Soyuz purged its engines with Nitrogen to ensure a controlled ignition, the tanks started ramping up to flight pressure when LOX and LN2 loading wrapped up and the launcher switched to internal power, also assuming control of the final minute of the count. The third stage umbilical retracted from the rocket and was followed by the Core Stage umbilical tower at T-20 seconds, coinciding with the ignition of the RD-107A engines on the boosters and the RD-108A on the core. The Hydrogen-Peroxide-driven turbopumps of the engines were heard spinning up to flight speed to initiate the combustion process, but only seconds into the ignition sequence, an automatic engine shutdown was triggered through the АВД Command. The engines were immediately purged and Soyuz vented its tanks, visible as a large amount of gaseous oxygen was released from the vehicle. Some smoke was seen rising from the base of the rocket after the aborted ignition. Roscosmos confirmed that the engine shutdown was triggered automatically and reported that the cause was under investigation. Soyuz goes through a 20-second ignition sequence leading up to liftoff, starting with the spin-up of the turbopumps before the engines throttle up to an intermediate thrust level for a brief checkout. Data monitored during the engine check period includes pressure and temperature in the chambers, pump speeds and vibration. Going up to full thrust, Soyuz overcomes counterweights and lifts off from its pad when clocks hit zero. According to Russian sources, the abort was triggered before the oxygen valves of the engines were opened due to a missing indication from the propulsion system. An abort at this stage does not require refurbishment of the engines and will permit Soyuz to be returned to a launch posture rather swiftly. Due to some irreversible steps occurring in the last countdown minute such as the retraction of umbilical towers, an abort at ignition for Soyuz is not as trivial as for other rockets such as Falcon 9 or the Space Shuttle. After initial safing, the two halves of the Soyuz service structure will be raised and engineers will have to reconnect the various umbilicals to transition the vehicle back to ground power, complete de-tanking and safe the Resurs satellite that is also on battery power until the payload umbilical can be re-connected. 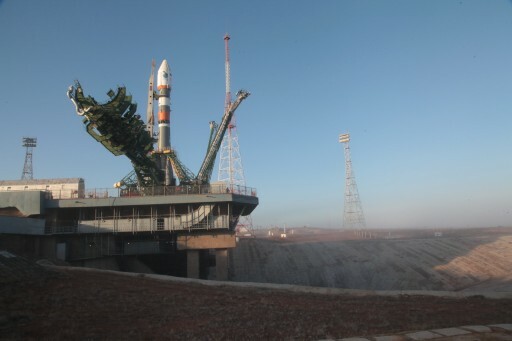 Roscosmos said the next launch attempt will be made on Sunday at 18:56 UTC, though a final decision will come after telemetry reviews and a State Commission meeting. This was the first on-pad abort for the Soyuz 2-1B version and the first for an R-7 type rocket in over a decade. Telemetry data will be analyzed to determine why the onboard computers triggered the engine shutdown and engineers will develop a forward plan from there. In case of a more serious issue, Saturday’s abort could have consequences for the planned launch of the crewed Soyuz TMA-20M spacecraft to the International Space Station on March 18 and the Progress MS-2 cargo-delivery mission set for liftoff on the 31st.